Display units are the most important output devices in embedded projects and electronics products. 16x2 LCD is one of the most used display unit. 16x2 LCD means that there are two rows in which 16 characters can be displayed per line, and each character takes 5X7 matrix space on LCD. In this tutorial we are going to connect 16X2 LCD module to the 8051 microcontroller (AT89S52). Interfacing LCD with 8051 microcontroller might look quite complex to newbies, but after understanding the concept it would look very simple and easy. Although it may be time taking because you need to understand and connect 16 pins of LCD to the microcontroller. So first let's understand the 16 pins of LCD module. We can divide it in five categories, Power Pins, contrast pin, Control Pins, Data pins and Backlight pins. RS: RS is the register select pin. We need to set it to 1, if we are sending some data to be displayed on LCD. And we will set it to 0 if we are sending some command instruction like clear the screen (hex code 01). RW: This is Read/write pin, we will set it to 0, if we are going to write some data on LCD. And set it to 1, if we are reading from LCD module. Generally this is set to 0, because we do not have need to read data from LCD. Only one instruction “Get LCD status”, need to be read some times. E: This pin is used to enable the module when a high to low pulse is given to it. A pulse of 450 ns should be given. That transition from HIGH to LOW makes the module ENABLE. Circuit diagram for LCD interfacing with 8051 microcontroller is shown in the above figure. If you have basic understanding of 8051 then you must know about EA(PIN 31), XTAL1 & XTAL2, RST pin(PIN 9), Vcc and Ground Pin of 8051 microcontroller. I have used these Pins in above circuit. If you don’t have any idea about that then I recommend you to read this Article LED Interfacing with 8051 Microcontroller before going through LCD interfacing. So besides these above pins we have connected the data pins (D0-D7) of LCD to the Port 2 (P2_0 – P2_7) microcontroller. And control pins RS, RW and E to the pin 12,13,14 (pin 2,3,4 of port 3) of microcontroller respectively. PIN 2(VDD) and PIN 15(Backlight supply) of LCD are connected to voltage (5v), and PIN 1 (VSS) and PIN 16(Backlight ground) are connected to ground. Pin 3(V0) is connected to voltage (Vcc) through a variable resistor of 10k to adjust the contrast of LCD. Middle leg of the variable resistor is connected to PIN 3 and other two legs are connected to voltage supply and Ground. I have tried to explain the code through comments (in code itself). As I have explained earlier about command mode and data mode, you can see that while sending command (function lcd_cmd) we have set RS=0, RW=0 and a HIGH to LOW pulse is given to E by making it 1, then 0. Also when sending data (function lcd_data) to LCD we have set RS=1, RW=0 and a HIGH to LOW pulse is given to E by making it 1 to 0. Function msdelay() has been created to create delay in milliseconds and called frequently in the program, it is called so that LCD module can have sufficient time to execute the internal operation and commands. A while loop has been created to print the string, which is calling the lcd_data function each time to print a character until the last character (null terminator- ‘\0’). We have used the lcd_init() function to get the LCD ready by using the preset command instructions (explained above). unsigned char a="CIRCUIT DIGEST"; //string of 14 characters with a null terminator. 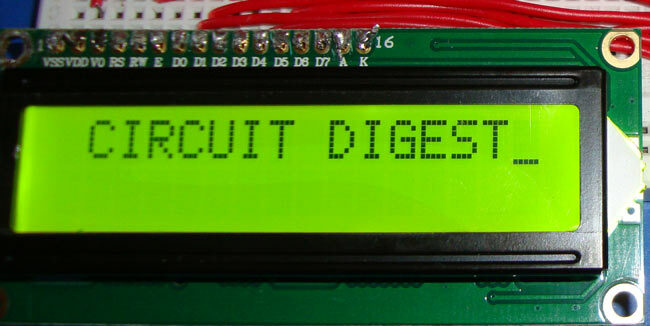 liquid crystal display is working but it is not display anything like circuit digest. Check your circuit connections again. hey..!!! your lcd interfacing code wwas really helpful. can you please provide me a code for interfacing LCD in 4 Bit Mode. Thanku for ur explanation and code.Can u tell me how to store multiple strings into LCD? sir, i used this code it is working while simulation(Proteus s/w) in laptop....but in hardware not displaying words in LCD.....it's showing blocks...plz tell what might be the problem..
Can I use blue character display instead of green. Can this project be shown on general purpose board?? ?